In the main event, Pawlak took advantage of his bye run in the Top 32 to replace a broken driveshaft that snapped during a free run. It meant he only just made the grid for the Top 16 where he faced Alec Hohnadell (USA) in the Rain-X / Permatex / Nexen / Hoonigan Nissan S14. Pawlak’s win then pitted him against the FD Orlando round winner, Chris Forsberg (USA) in the NOS Energy Drink Nissan 370Z on Nexen Tires. Forsberg qualified ninth and would eventually finish fifth overall but had no intention of giving Pawlak an easy ride. Their first runs were too close to call, so the Judges requested “One More Time” resulting in repeated runs and a victory to Pawlak courtesy of a mechanical issue for Forsberg on the final run. Matt Field’s day started in the Top 32 against Jeff Jones in the Doc X / Falken Nissan 370Z. He then faced Ryan Tuerck (USA) in the Ryan Tuerck Racing / Gumout / Black Magic / Nexen Tire Toyota 86 before meeting Forrest Wang (USA) in the Great 8. The latter would be an exciting battle that was decided by a collision in the second run when Field collided with Wang’s Vapetasia / Achilles Radial / NRG Innovations Nissan S15. The Judges ruled that the incident occurred when Wang braked before the Decel Zone, causing Field to make contact. The decision would see Field advance to the final against James Deane. 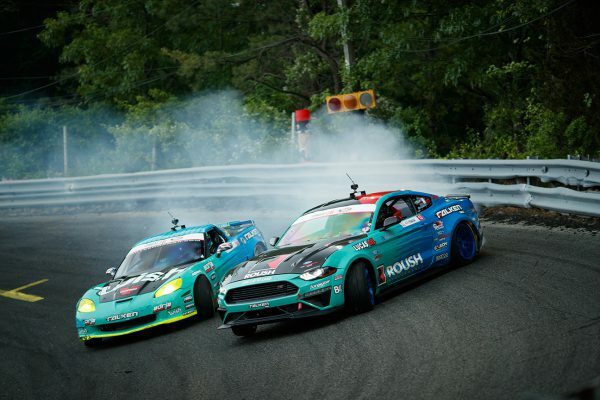 Having qualified third in his Worthouse / Falken Tire Nissan Silvia S15, the 2017 Formula DRIFT champion also had a challenging path to the final. It started against Kazuya Taguchi (Japan) in the Achilles Radial / Up Garage / Top 1 Oil Nissan GT-R. Deane then met his own team-mate – Piotr Wiecek (Poland) in an identical Worthouse / Falken Tire Nissan Silvia S15. With the same machinery and both drivers on top form, it was an epic battle that kept the fans on the edge of their seats. The decision would go to the Irishman, who moved on to face Kenshiro Gushi (Japan) in the GPP Toyota Racing / Falken Tire Toyota 86. Ken was unable to slow Deane’s roll as he headed to the Final Four, where he faced Odi Bakchis. 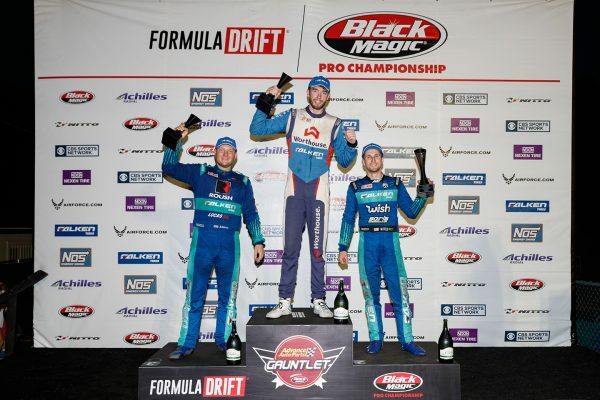 With his second place finish, Field moves to ninth in the 2018 Formula DRIFT championship. James Deane moves to first, displacing Fredric Aasbo for the first time since he won the opening round. 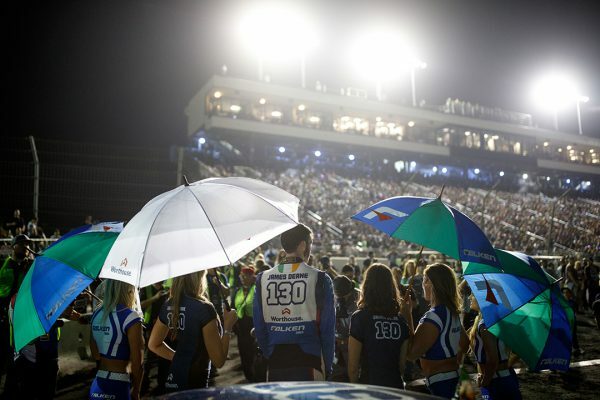 Justin Pawlak’s third place elevates him to fifth in the championship and gave Falken Tire a clean sweep of the podium. 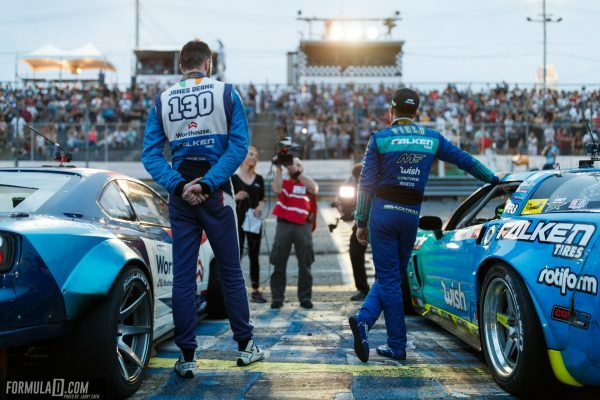 The result also allowed Falken to jump ahead of Nexen at the top of the 2018 Formula DRIFT Tire Cup. 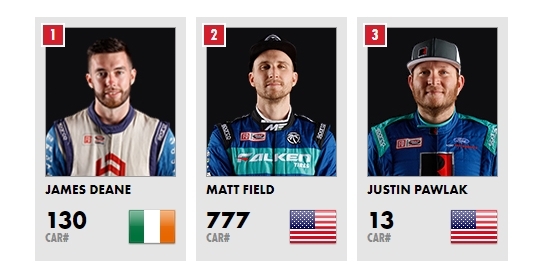 And finally, Ford moves to second place in the 2018 Formula DRIFT Auto Cupahead of Nissan, largely thanks to Pawlak’s consistency. They sit behind Toyota in first place courtesy of Aasbo’s dominance.